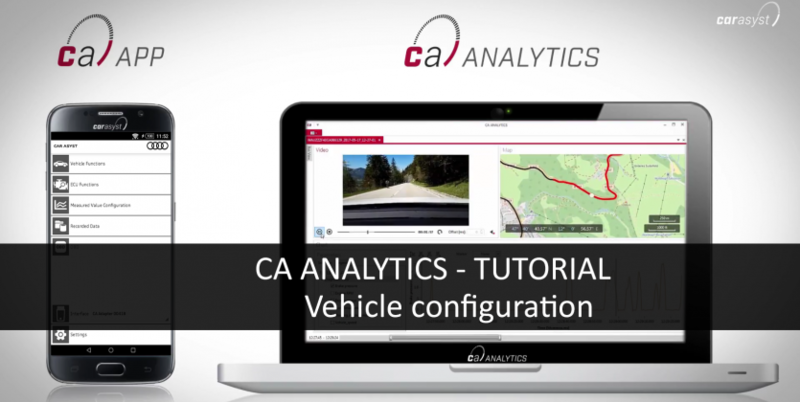 The tutorial “CA ANALYTICS – Vehicle configuration” shows you how to create a new vehicle configuration. To create a vehicle configuration you have to know the vehicle type and the vehicle ECU details. You can retrieve the information by using the CAR ASYST APP and “vehicle functions”. The first step in the vehicle configuration is to “select the car model”. After you have selected the model, you can save the configuration to the PC as the basis for the configuration or partial configuration. In the second step you can enter “general information”. Then you select the “Settings”, such as the GPS and video recording. In the third step you can choose the mirroring mode and select the buses you want to record. You can use multiselection mode by holding down the SHIFT key on the keyboard or you can pick the buses by holding down the “control”button. In the fourth step you can select the “diagnostic data” to be recorded. To set up the configuration properly you have to know which ECU variants have been built into the vehicle. To retrieve this information you can use the “vehicle identification” function in the CAR ASYST APP. Once you have identified the correct ECU variant, you can select the measurement values you want to record. The next step is to transfer the configuration to your mobile device. Now your configuration is ready for use. For more Tutorials, Tips & Tricks join our CAR ASYST YouTube Channel.